Port-au-Prince, Haiti (CNN) -- In the aftermath of Haiti's devastating earthquake, a small radio station became an informational lifeline for people in Port-au-Prince and beyond. The radio station, Signal FM, managed to stay on the air during the earthquake, leaving music playing while its employees fled the building. The station's studios and broadcasting tower withstood the 7.0-magnitude quake, and with electricity provided by multiple generators, it became one of the few places stunned Haitians could turn for information and directions in the following days. "We say that the only way communicate with the people and the world to is to stay on," station manager Mario Viau told CNN. "And we stayed on." Signal FM has stayed on the air throughout the nearly two weeks since the quake, though occasionally broadcasting at reduced power. 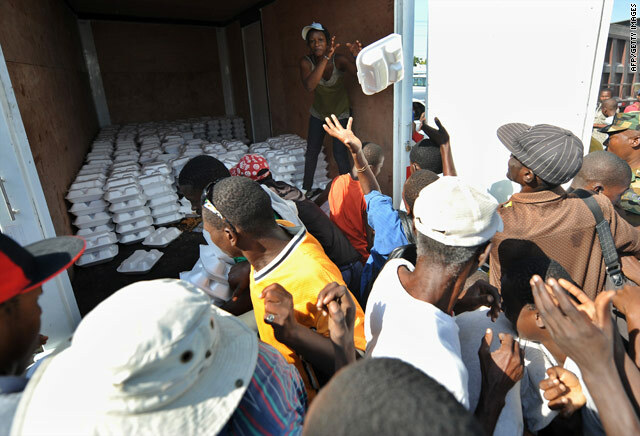 At first, it had only three days of fuel to keep its generators going, but the Haitian government and private organizations contributed more. Viau said he went on the air shortly after the earthquake, telling listeners "that we have been hit by an earthquake, and, you know ... say the radio station is there. We gonna talk to you." The station quickly organized a panel discussion with reporters, talking about what happened and getting dire reports from the surrounding city. "People would come, and say I have this problem ... people are dead this way, why don't you send somebody that way. That was the first day," Viau said. "The second day, they were saying we need water there, we need doctor there, we need food there. That's how it started." The station's broadcast signal reaches about 3 million people around Port-au-Prince. And it has international reach via the Internet, allowing people to get messages to relatives all over the world. "Somebody would call and say if you're alive, come in front of Signal FM [and] I'll meet you at this time," Viau said. Others have used it to inform search-and-rescue workers about sites where people may still be buried alive, as well as food and water distribution sites. People now bring letters and notes to the station to be read on air. One woman went on the air, out of desperation, to ask for help in finding her husband. When it worked, Viau got the bear-hug of a lifetime from the man. "You should have seen him. He was almost choking me," Viau said. Radio is a powerful tool in a country with a literacy rate of about 62 percent, according to UNICEF. And with tens of thousands of people now living in tents or makeshift shelters, aid agencies have been distributing portable radios to keep them in touch. The U.S. Army has been handing out solar-powered and hand-cranked radios to an estimated 50,000 to 80,000 Haitians now housed at a former golf course in the Port-au-Prince suburb of Petionville. The military will be broadcasting on three different radio stations. "We'll pull people out of the audience and we'll ask, what's one thing you want to know and what's going on out there, that we don't know," said 1st Lt. Jeff Wozencraft of the Army's 82nd Airborne Division. The tents and tarps sprawling across the Petionville green has been sectioned off into communities, with an area to buy food and clothing, and even to get a haircut. Some vendors use car batteries to charge cell phones for 50 cents a pop. One of the tens of thousands now housed here is 22-year-old Louis Richardson, whose mother, father, brothers and sisters died in the quake. Taking shelter under a tree from the stifling heat, he told CNN that Signal FM is "the most important source of information now." But as he spoke, he wasn't listening to news. He was listening to "You Are Not Alone" by Michael Jackson. A small Port-au-Prince radio station stays on air after the January 12 earthquake, helping people coordinate aid distribution.